The first three days were a combination of jet lag, 2 maps, 1 race, and getting out of bed at 2pm at one point, subsequently taking a rest day. Hence comes my compilation about my current impressions of Finland, how this JWOC is going to turn out, and onward will follow. 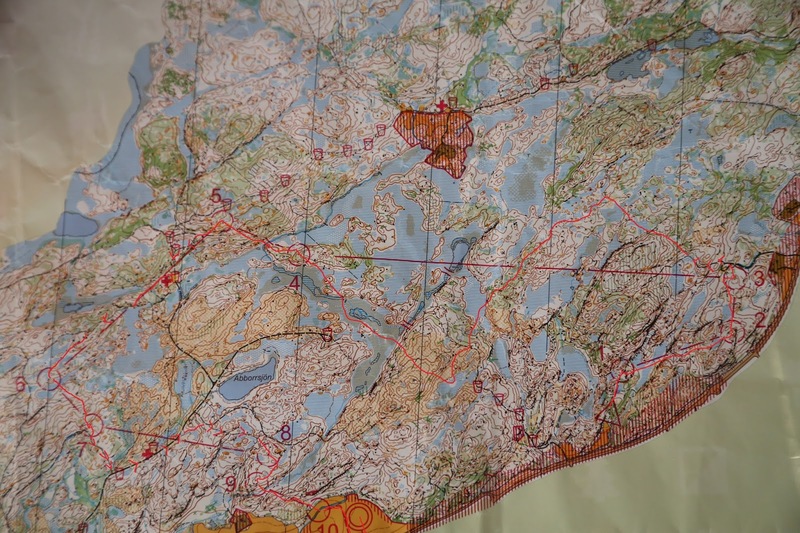 On the first day, I was kind of itching to get on a map, because we happened to live by one, and was torn between resting (as we flew in that night) or going for a run. So after a few hours of contemplation I ended up deciding to go for a run. Initially I was thinking about doing something easy and short like 5km, but as I approached 5km, then my hand kept drawing until I had a nice 8km course done. So I was like “meh” and went to run it. Aside from the first hardship (running the day you fly in) I managed to not memorize the route to the start very well and ended up running an unintentional loop, clocking a solid 3km for my warm up. 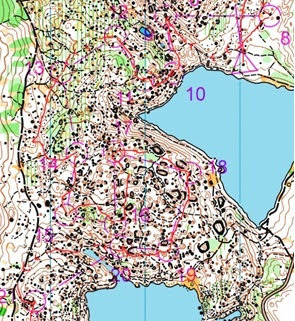 The terrain was pretty (as in really) good, and could be compared to the likes of the technical difficulty of OO-Cup, or the finest maps that Norway and Sweden have to offer. 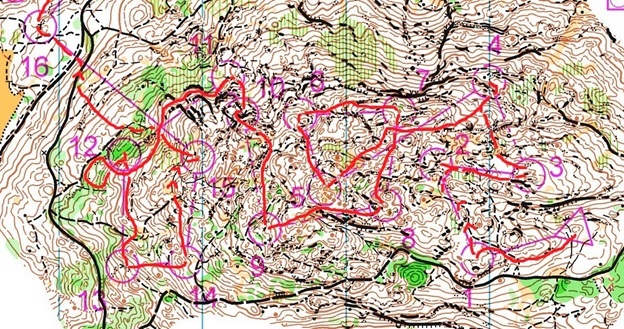 In this first training, I had a hell of a time remembering how to run straight on a bearing in such complex terrain. 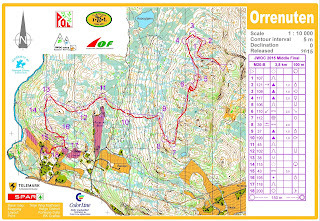 (To make myself feel better I do remember Ollie Ojanaho, and this Czech dude slowing down to my speed at JWOC on a certain leg on which they were passing me on, in order to avoid making a mistake) So that was problem A), with problem B) being running fast, this terrain in certain places is very close to the vegetative mess that we have back in Bow Valley, so the running would be very suitable for me (had I trained a bit more) alas it is just as difficult, if not more, due to the rocks that are everywhere. After the first four kilometers, I was able to re-calibrate into a sort of rough style that uses the compass as a major crutch. A little more than I would like it to, but what can I say? If it works, it works. And so far, its been working well enough. Below are some legs that went better then the above ones. 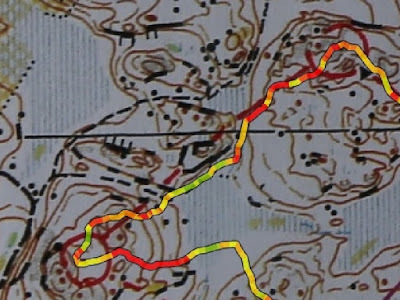 The method is, using as precise a compass as possible, and then a joint focus on reading the large contours (on this map, meaning the hills) and sort of using your peripheral vision to know where you are in the terrain. The components of this method that I still feel I lack are speed and accuracy which come hand in hand. Starting with accuracy, I don’t have an exact enough perception of my location, and all the features in my midst until I am approaching the control, or am passing through an area where I am surrounded by details, and want to make sure that I’m staying on my line. In order to utilize this perception, I need to slow down into a jolty walk/jog. Effectively I’m just complaining that I can’t run through this really detailed terrain. SO, plan for bettering, will be outlined in the conclusion of this post. The rocks are really good, so you want to use those to figure out where you are at when you can. On my second training I constructed a leg where you literally had only your bearing for navigation, and had to hit a rock, I missed and got one to the right, but it comes to show how mandatory they are, and you need to be able to use them. Knolls are great; you just need to understand the size of the ones which are mapped, because some are, some aren’t and you just gotta get that sixth sense for which ones are the right ones. By the end of the first training, I sort of had a bit of flow. The second training, which I was accompanied with by my little brother, was a bit more technical if I dare say so. 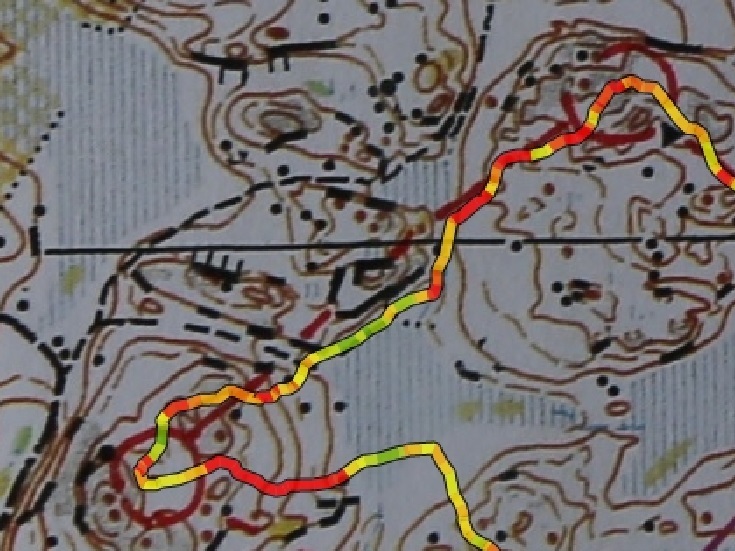 (he took 6 hours and I took about 3h) I purposefully chose the most technical sections that were left and so even my pace was diminished, as one could see by the end of the course by my GPS line (which is mostly red meaning slow). I was much straighter on this training, which is a joy. Yet I’ll still need to work on the speed. Off to a better start than yesterday. Faring a bit better in the complex areas. One leg ended up being one of the hardest that I have ever run in my life. It effectively became a blind bearing, but I had a the subtle wisps of an idea of where I was and therefore I would still count it as skill; as opposed to pure luck. I managed to hit the control fairly accurately, with a very good line. After running back home a whopping 5km (I intended to do a line-o but was running late so skipped it), I was out for two hours before waking up for the race that I missed in Tampere. (Which was fine because I couldn’t race and there was less pressure like this) Fortunately for me the controls were still out, and I had my GPS watch hence the pretty track you can see below on the map. Some legs that show my one-day progress. Because the terrain was simpler, I was able to go faster, (still super tired though) but it was great and in hindsight, I know I just need to focus on planning ahead in order to eliminate the stops and walks that occur in parts. I think if I focus on these two things for the next few days, my navigation and speed should stabilize and decrease respectively. I will probably attempt to achieve this through more high (possibly over) speed orienteering, where I really get the process of bearings, reading ahead, and checking the map and terrain down. I’m thinking of 4-5 leg intervals under a kilometer, with breaks in between, on different maps, in order to max out that speed and highlight my critical mistakes. The 2016 OO Cup took place in three different countries this year, with one day in Italy, two in Austria, and two in Slovenia, exposing the runners to a plethora of different terrains. 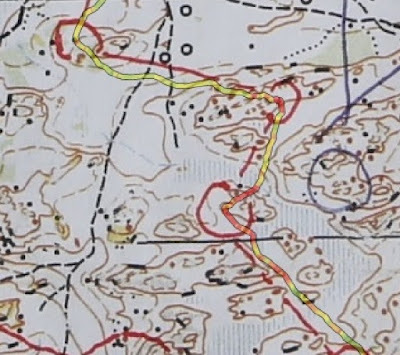 Runners were blessed with very complicated maps for the first two stages of the race which heeded it a necessity for contact to be kept all along the way. 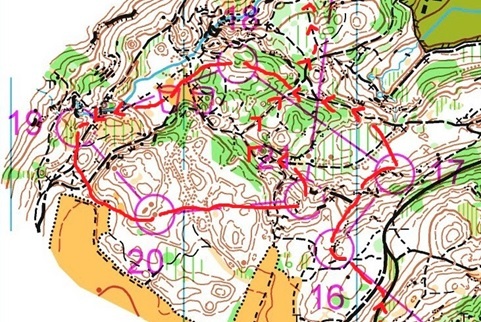 Personally my favourites, I will go into detail about the terrain type and running style that was exhibited in the first two stages, as each took place in a different country whose terrain varied completely. 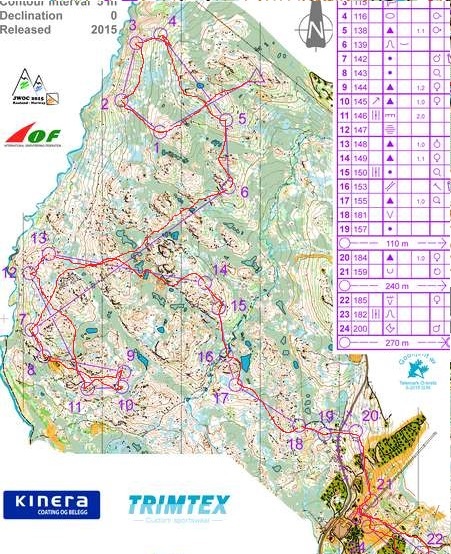 The first day’s course was a neatly constructed middle distance, where a majority of the running was in the complex forest while the rest of it was full of features that made it a pleasure to orienteer in. 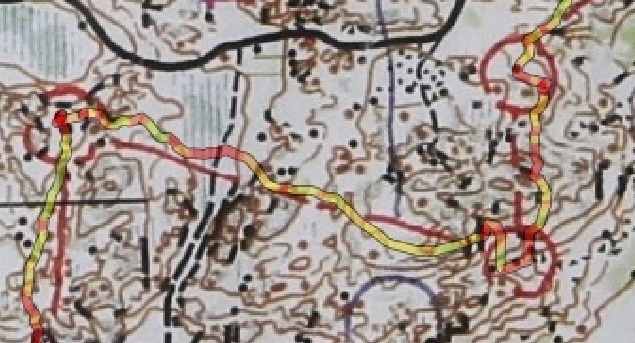 One long leg with route choice was included that required choosing the trail that one would run on and following it nearly all of the way to the control. On the course I had made a total of two big mistakes. 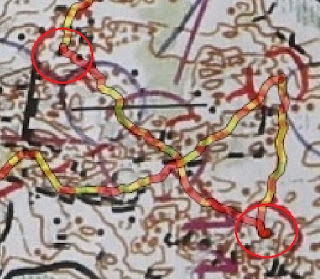 One was near the beginning going into the second control and the second was at a relatively easy section as I was attacking the twelfth control. In the first case, I had made a good plan and executed it perfectly up to the control circle, where I misinterpreted the contours and did not have a very strong bearing. This caused me to slow down and veer a bit to the right onto a small hill from where I regained perfect contact of the map. This little hitch most likely cost me a minute of the race. The second mistake that I made was due to a failed speed change, as I ran into a simpler section of the map. I wasn’t in full contact with the map and was coming at the control a little bit high. When I came down to attack then I misinterpreted the scale and came down the wrong wide spur, and landed on the trail. Not knowing where I was I went left along it and cut up from where I could see the very large re-entrant, and could make my way back to the control. I lost a whopping 4 minutes due to that mistake. I believe that I made it because I was a little too high and I didn’t see the re-entrant in the control circle. When I saw a different one, then I had cut down to the right of it, and made the parallel error. For the rest of the course I managed to spike nearly every control therefore I must have been doing something right. I’m fairly good at using contours as reference points, and in this terrain that seemed to work very well. To controls 1, 2, and 3 that tactic worked fine. Locating 4 was trickier as there is a knoll and a bunch of cliffs in the circle; therefore in that specific case it was again better to look for the obvious re-entrant that it was placed in. A control that required lots of micro navigating would have been 5, where one really had to check off all of the features on the way to the clearing after they got onto the hilltop. After the clearing, I pretty much walked into the control on a hard bearing and with constant verification of features that were on the way, most notably the cliff. For more complicated controls this technique nearly always worked. 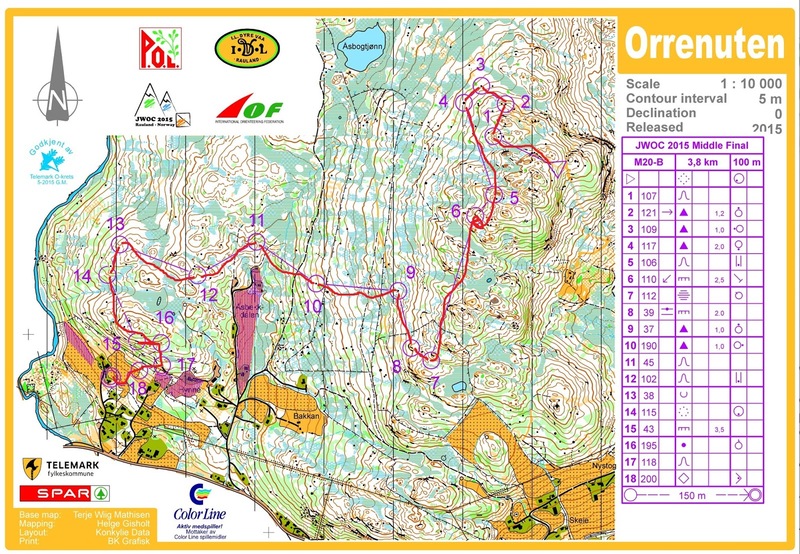 The transition into the simpler part of the course was easier and gave time for a portion of easier orienteering. 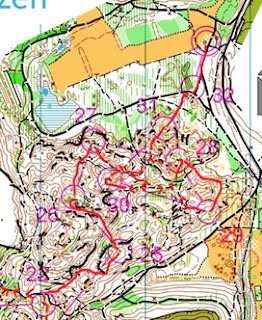 At this point I was personally quite tired and had to brace myself for the rest of the course from control 20 – 21. The water control was also very motivating at this point in the course. For the long leg I stopped, as always, for a few seconds and planned it out where I think that I was able to pick the best route choice. 22 – 25 became a bit of a dog leg, as I chose the same route out that I had taken in. In the last part of the course the most important thing to do was to keep focused on map reading and not to get lazy. It was easy to simplify a route choice too much and end up making a mistake. For the most part these legs were easier than the first part of the course, as there were more trails, and less details. The Stage 2 map was the highlight of this year’s OO Cup for me. 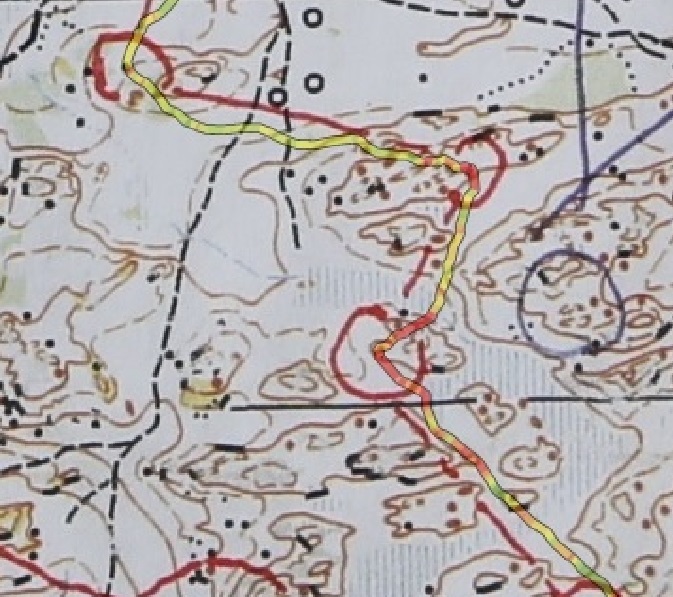 The course planner didn’t hesitate to get right down to business when it came to it, staring the course off in the hardest section of the map. On this map, the strategy that I went by was checking off each feature as I passed it, and stopping as soon as I exceeded my map reading speed. 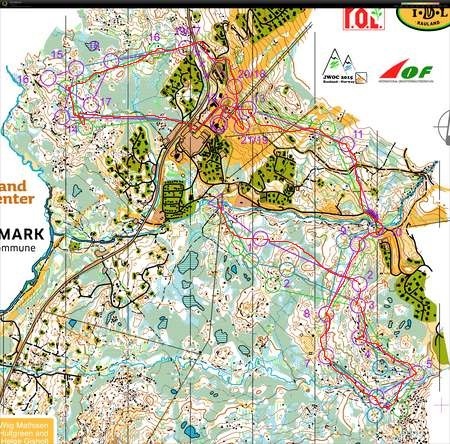 This way I was able to finish the course with a sum of 2 mistakes, adding to about 2-3 minutes. My first mistake happening on the way to 4, where I exceeded my map reading speed on a bearing and stopped just short of the control to relocate, this took at least a minute as I stood there before I found the two large cliffs just N of the control. After that, I simply continued each leg with a more or less straight plan, which minimized the distance I would have to navigate and run. The only other navigational mistake that I made was a compilation of distance misinterpretation, compass laziness, and misreading the terrain. On the way to 14 I was drawn into an elephant trail that was bigger than the normal trails on the map, and thus I began misreading all of the terrain. I had also disoriented my map slightly and thus hadn’t been watching my compass. When I was about halfway to the point at which I realized that I was in the wrong spot, I should have noticed that I had gone too far without seeing any green. Thus my mistake concluded with me cutting left, and relocating then going back to the control from there. 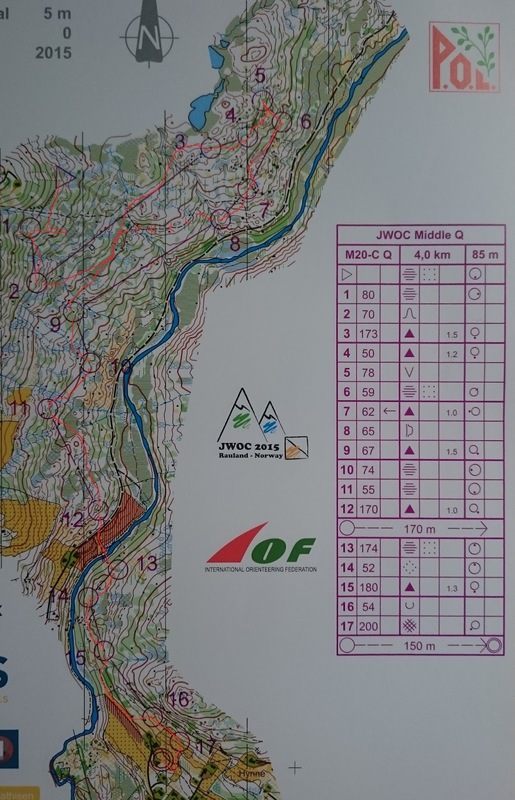 In the detailed sections my orienteering was adequately sufficient to spare me of needing to deal with mistakes. On a leg like 17, I would make a solid plan and execute it nearly perfectly. In this case it was to come around the right side of the cliff on the hill, go on the left of the massive cliff, and on the right of the smaller one, cross the path, between the gap of the two cliffs, then cross the saddle with the rock in it. Just beyond that I knew that there was a clearing from which I could take a bearing noting the rock on the way out, and the slowing down into the area in the re-entrant, and finally finding the rock with the control. Most of the legs compiled of a long sequence of steps like that, in which if you left one out, you could make a fatal mistake on the whole for that leg. The last few legs seemed relaxing compared to the constant focus of the previous part of the course, as here you could simplify more and think just more about running. Overall the terrain was amazing, and the map was probably the most complex middle distance map that I’ve ever run on in my life. 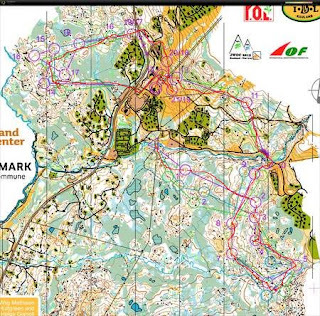 The course planning was great, and the overall organization of the OO-cup was amazing. This event is one of those that elite orienteers definitely must go to at least once in their life! After a number of bad races, and a mediocre one, the last event; the chase turned out to be my best result. Although people used different tactics for this race, such as taking the first controls very quickly in order to catch up to the person ahead of them in order to use them throughout the rest of the course, I was isolated as I started 2nd last in my age category. By the 4th control I had passed 20 people, and so there was nobody around my skill level whom I could use. This also meant that I wasn't being distracted by anyone else in the forest, which might have been in my favor because I was able to have a stellar race where I made nearly no mistakes. The only misfortune I had was near the end when a massive elephant trail that was naturally unmarked on the map, disoriented me and caused me to lose a minute as I ended up in the re-entrant just to the left of the correct one. Ultimately I came in with the 12th fastest time in my age category. This was the best race of the whole week for me. 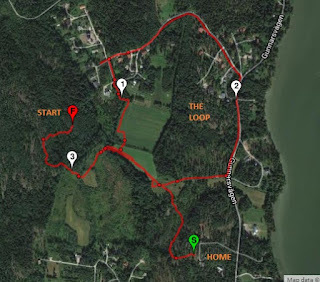 My first race at O-Ringen for me went terribly. I had a good start catching the guy ahead of me on the first control, then catching the guy ahead of him on the next one. I lost a bit of time on three due to an imperfect plan. To 4 I did not solidify my plan enough and blew it right after the big hill by not navigating and just running towards a big marsh through a complicated section with my bearing. Then I saw a hunters stand and thought it was an X on the map, and so I changed my direction from there, and began running parrallel to the complicated section making it nearly impossible to regain contact with the map. From there I continued running making up where I was on the map until I found a really big open hill, spent a minute looking for it on the map, nad finally climbed up it and found where I was. Then I crossed through about 300m of crappy marsh to get to my control. On that leg I lost 15-20 min and therefore gave up and jogged the rest, as with such a massive mistake there wasn't any more point in racing anymore. 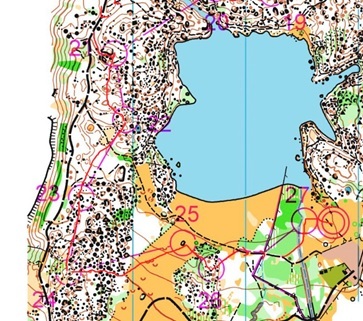 The JWOC relay was an intense race in a slightly different way from the others that I had run this week. This time, I was running the first leg, which meant I began in the middle of the pack with no spacing. There was 2 meters of distance between me and the best runners. This puts a little more pressure onto you when you run. When the gun signaled our start then the group stampeded to the start triangle. I let myself be passed by people who were going faster as I tried to read the map. In the future I believe that I will try to stay with part of the group and keep my pace up so that I run among more people out on the course. 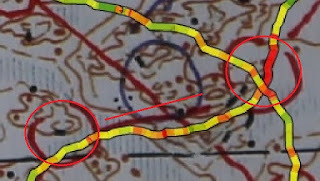 To the first control I was drawn off of the optimal route by a group with a different forking, and got my control about 10-20 sec slower then I would have if I had run up the marsh. I learned that if you run the first leg of a relay, then it is very useful to be physically comparable to your competitors. When there is someone 20m ahead of you then you can save a ton of time if you know where they are going, and that you need to go to the same place so for 30 seconds you can relentlessly chase them down at a faster speed then you could if you were navigating. Unfortunately I did not have this advantage, and ended up not being able to chase any of my competitors down physically. Up to the spectator control my race was relatively clean navigationally, and I stayed ahead of people by not making mistakes. Through the chute I tried focusing on my upcoming legs and did not run so fast, which proved to be detrimental afterwards as I was passed by two faster runners. The mistake I made was when I did not slow down enough in the last part of the leg after the chute. 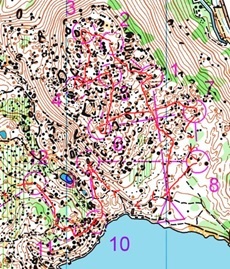 The terrain became very technical and my plan was inadequate and so I lost a minute correcting my mistake. I ran with a couple others at this point, unfortunately leading, as a) I didn't trust them b) I was doing my own thing. The final controls I was able to nail perfectly, and before the pre-go control I saved myself as I came up a steep hill by walking. Then I took a good route to the second last control but lost about 5 seconds to the go control by cutting straight up a bank and some vegetation. At the go-control there were two others with me and one of them put off a fresh 400m pace off to the finish passing me. If he had kept it up then he would have beat me who was trying to keep up with him without killing myself completely. Fortunately that only lasted about 50m, and so with about 100m left I sped up. Seeing/feeling him not speed up behind me gave me more energy and so I was able to keep the pace up all of the way to the tag off. 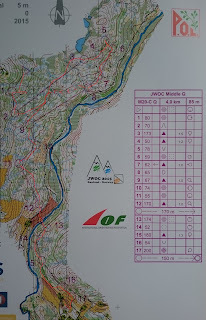 It was a good thing to know that my main limiting factor for this year's JWOC was my physical strength, and yet I was able to improve by roughly 25 spots in the long distance, and at least 35 spots in the middle distance from last year. I looked forward to the Long. Last year if I hadn't mis-punched then it would have been my best result. I knew that the format was less technical but expected hard parts to appear on the course. Right from the beginning I was ready for a difficult leg and braced myself for it. Unfortunately when I flipped my map then I was met with a simple leg once again, and had no problem with it. I nailed every leg up to 4 which I ended up overshooting and loosing a minute. This was my only significant navigational mistake during the whole race. I was able to make correct plans and route choices for pretty much every other control. 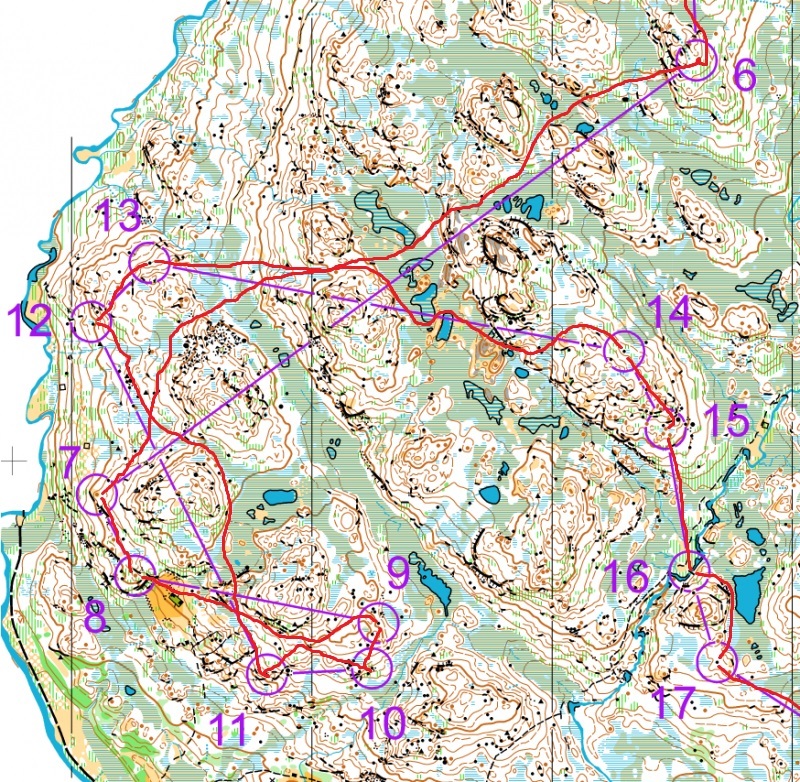 The terrain was relatively easy with one very difficult control where even the winner slowed down to a walking pace. Otherwise, some areas were more technical then others but it was all bearable. 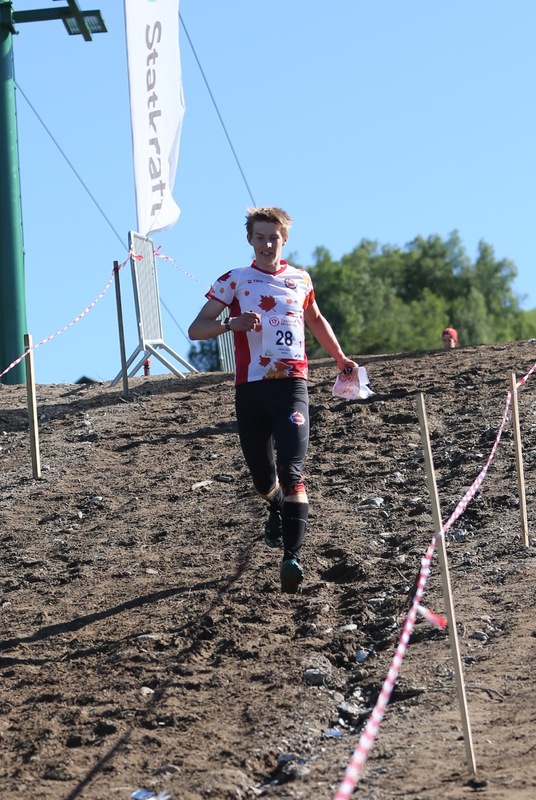 I had a fantastic run otherwise and it ended up being my best result this year, 80th place, a decent number to work off of towards the future with 4 more years of JWOC ahead of me. Next year my goal is to solidly place into the A-final and optimally come in top 30. The Middle distance qualifier had portions of orienteering that were probably the smoothest that I had ever run. Unfortunately my start and speed capped off my rate of success. The first control was my one and only mistake, I saw the leg and tried making a plan, but it was a fairly vague control and so my plan also ended up being vague. 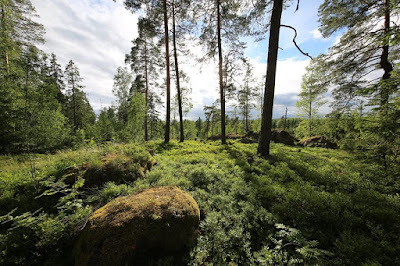 Thus instead of passing the rocky ground and continuing on to the control, I was just south of my intended path and ended up in the center of the forest with no features off of which I could navigate. I though that I saw a tip of a marsh down south and hoped that I could use it to relocate. I went quite a ways before I ran into the large marsh where I relocated and was able to hit the control. The guy behind me caught up and so I knew that I had lost over 2 minutes on that control. From there The rest of the course went very smoothly. Every leg was easy to make a plan for and I was able to execute those plans more or less perfectly. At one point a Dane caught up to me and so I tried keeping up with him for a while. I managed about two controls before I continued back on my own, it was very difficult to navigate and run at the speed that he was putting up. I had to slow down in order to know where I was. After the race, I placed 33 in my heat; 4 min behind from qualifying into the A-Final. 2 of those minutes could be attributed to my one mistake, but the rest is a result of my navigational/running speed. Though I was slow, I still managed to qualify for the B-final which was a huge improvement from last year. From there I prepared for the final by looking back on my quali, and seeing what I could possibly make better, I therefore focused on going slow to my first control. Unfortunately, my first control was very easy and so I did it perfectly and wasted no time in slowing down. By four I had caught up to the two starters ahead of me, but managed to look and start planning 6-7 as I was running 5-6. I realized this after about 10 seconds of running but by then it was relatively too late, I had lost contact and now I needed to relocate. Being a bit further East of the control then I had anticipated lead me to take a solid 3 min to find the control. After this mistake cause by lack of focus, I engaged in what one may call "Beast mode" and I began running very aggressively for the rest of the course., both physically and navigationally. This saved me a bunch of time overall, but sadly it led me to take one of the last controls too directly and lose about a minute. I overshot 15, found 16 and came back to my control from there. I passed a Dane who was running slower then me about 3 times. First when I caught to him (he started 2 min ahead of me) then subsequently after I made both of my mistakes. Canadian high performance orienteer and competitive indoor wall climber. 3x North American Champion in Orienteering.